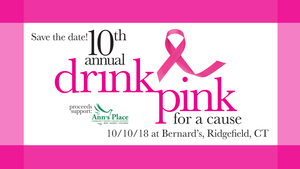 On October 10, 2018, from 6 to 8pm the 10th Annual Drink Pink for a cause will take place at Bernard’s in Ridgefield. This event supports Ann’s Place while putting a spotlight on local breast cancer patients and survivors. We are expecting quite a crowd at this year's 10th Annual event and encourage you to purchase your tickets ahead of time to avoid waiting on line at the door! The cost to attend is $20 and all proceeds benefit Ann's Place. What do you get for $20? One of the best nights of your life, a pink ticket good for one pink beverage (alcoholic or non-alcoholic) cheese (courtesy of 109 Cheese and Wine), a Live Auction, opportunity to participate in a 50/50 raffle, live music, and - an up-close look at Kristen Jensen's photographic collection "Courageous Faces". Purchase your ticket ($20) HERE. Please note: tickets will still be sold at the door!